D. Chandrasekar the Founder, Thejus, G. N. Chetty Road, T. Nagar (near Jeeva Park), has organized ‘Celestial Weddings Swarna Kolu ‘ in their premises between 11 a.m and 7 p.m till Oct. 21 as part of Navarathiri celebrations. 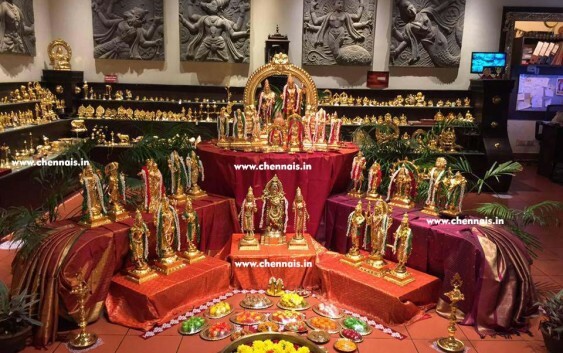 The theme is Celestial Weddings – Deiviga Thirukalyanam. The Kolu dolls are 24ct Gold Plated idols of various God couples. 17 Celestial pairs and the details of their wedding has been displayed in a unique manner – Meenakshi with Shiva , Parvathi with Shiva, Rukmini -Sathyabama with Krishna , Valli Devayani with Murugan, Siddhi-Buddhi with Ganesha, Seetha with Rama, Andal with Maha Vishnu, Padmavathi with Srinivasa, Lakshmi with Vishnu, Radha with Krishna, Pushkala -Poorana with Saastha, Saraswathi with Brahma. The Kolu invitation itself was done in the traditional Manjal Patrikai style inviting everyone to the celestial weddings. The Seer Bakshanams made for the weddings is all handmade Miniature clay models all handmade by the Thejus members. The return gift to all who come for the Kolu is a small tray with Miniature Bakshanams and sweets and this can be used as a Fridge Magnet. There will be a cultural programme everyday from 4 p.m to 5 pm by the young talents mainly from music schools in includes Suswaara School of Music, Emdeeyes School of Music and Shadjam Music Trust.